Grand Wailea, A Waldorf Astoria Resort pays homage to the people, culture, and natural beauty of its Hawaiian Islands home. 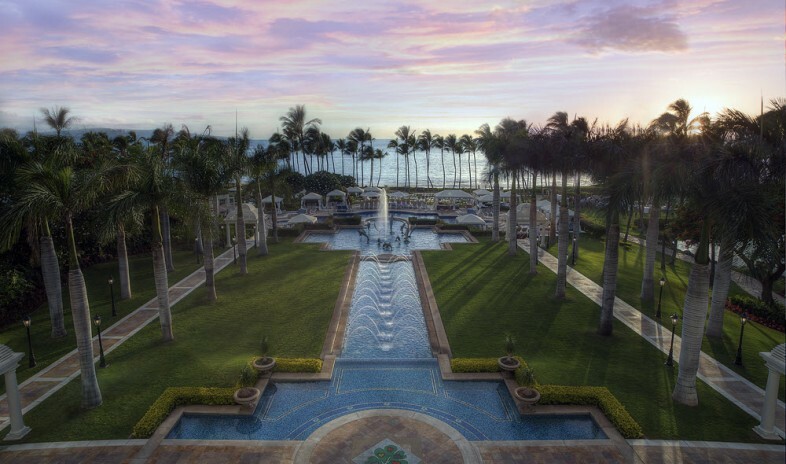 The resort spans 40 tropically landscaped acres adjoining Maui’s picturesque Wailea Beach—a magical backdrop for inspirational meetings, truly rewarding incentive trips, and exceptional team-building opportunities. At 26,700 square feet, the Haleakala Ballroom ranks the largest among Hawaii’s resorts, and hosts up to 1,600 banquet guests. In such an agreeable climate, many planners opt to take their events outdoors, perhaps into the adjoining Haleakala Gardens or spacious Molokini Gardens, where tiki torches, an imu pit, and lava rock walls set an authentic Hawaiian ambience. A series of smaller venues, tastefully furnished, offer executive groups several options for presentations requiring the latest technology. When meetings end and relaxation begins, the hotel fills the bill with a host of activities. Water lovers head to the beach or Wailea Canyon pool complex, which entertains with waterslides, waterfalls, even scuba instruction. Others head to the Wailea Tennis Club, trio of championship golf courses, or Spa Grande for treatments inspired by Eastern, Western, and ancient Hawaiian traditions.Throughout the day, groups can look forward to drinks and meals at no less than nine restaurants and lounges on-site. Menu choices range from California and island cuisine at Bistro Molokini to the global convergence of flavors at Amasia to fresh lobster with sunset views at Humuhumunukunukuapua’a. Groups retire to a choice of 780 guest rooms or 70 luxury villas, each equipped with the latest amenities, each capturing the peaceful nature of its location. I took a group of ~70 for four nights.We were in run-of-ocean rooms that had been recently renovated and they were lovely. The conference services staff was awesome to work with! We had a group dinner on the Chapel Overlook and my group raved about the food and the view. We used Island Partners Hawaii for transfers and they did an excellent job. Overall a home run and I would not hesitate to recommend taking an incentive group here and working with this awesome group of people! My facilitator said the group's experience was fantastic, and he would book more meetings there in a heartbeat. I have stayed at the hotel twice attending conventions. What a beautiful property. It is definitely paradise. I've used this property twice for a WW Sales Meeting. It is impressive for everyone including the children that accompany their parents. The conference services staff is very flexible and easy to work with. They take care of things you may forget to think about. They took care of our offsite day trips and transportation to/from the airport. It made it very easy to have this all taken care of. Best spa experience we've ever had for a large group. Everyone raived! Encourage guests to leave several hours to enjoy the spa BEFORE their scheduled treatment. The meeting space is nice and most offers at least some natural light. Lots of great outdoor meeting space. Food and beverage services around the pools and cabanas was extremely slow. Great for groups that include spouses and children. The pools, waterslides and lazy river offer all day entertainment. The shops at Wailea are great and the golf courses are wonderful. The rooms are nice but just a bit rough around the edges. The tower rooms were renovated more recently and are a bit nicer.